The Asian Hiking Team offers a small variety of carefully crafted, rounding a hill to gain a spectacular view, sharing wine, fondue, and laughter with new-found friends, or waking up to fresh green mountain air and the distant tinkling of cowbells a Kathmandu memorable private day hiking tour is something that needs to be experienced yourself to be fully appreciated. We work hard to create fun, authentic, affordable day hiking tour in stunningly beautiful surroundings. 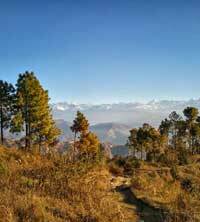 The trail leads over a mountain crest magnificent panoramic view, pine forest and Nepalese inhabitants. 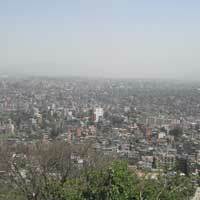 The Kathmandu city is increasingly spreading up the surrounding hills. The uniqueness of the terrain, the diversity of ethnic groups and the beauty of both the peoples and the biotope in Himalayan countries make them a must for any hiker devotees. 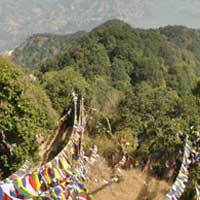 Nagarkot is trendy visitor's choice at an elevation of 2175 meters above the sea level. Discover the great views of the Himalayas, including Annapurna, Manaslu, Ganesh Himal, Langtang, Dorje Lakpa, Gauri Shanker and Everest ranges. The view from Nagarkot is like mountain flight; once the sun begins to rise from behind the Himalayas, it looks spectacular as mountain changes its color. Our day hiking is leading to Changu Narayan; all the way riding of the hill passing through pine forest, Nepalese inhabitants. The Temple of Changunarayan situated at an altitude of 5000 ft on the hillock to the north of Bhaktapur, it is one of the oldest temples in Nepal. Changunarayan Temple has distinct historical and architectural significance. The erection of Garuda Pillar by Manadeva is an expression of his devotion and reverence to Changu Narayan as learnt from the inscription, points that the temple of Changunarayan was built sometime before 464 AD. Early morning we start driving to Nagarkot by private vehicle. It will take merely one and half hour to get there. We will arrive to Nagarkot before sunrise so we can see the first ray of sun in the Himalayas as well as enjoy the panoramic view of dazzling mountains. The panorama of the Himalayas, including Annapurna, Manaslu, Ganesh Himal, Langtang, Dorje Lakpa, Gauri Shanker and Everest is a breathtaking view. We will take breakfast in Nagarkot and we start hiking down to Changu Narayan. The hiking tour will be some around 3 hours. We will arrive to Changunarayan, a famous temple and picture square of Kathmandu in the afternoon. After Changunarayan we will drive to Bhaktapur Durbar Square, a historic town in Kathmandu valley full of art and culture, where we will take lunch and visit around. We will get back to Kathmandu around 3'O Clock and will arrive here around 4'O Clock.